Surfing and Water sports in Los Cabos! Baja Sur has been a popular surfing destination since the ‘50s. 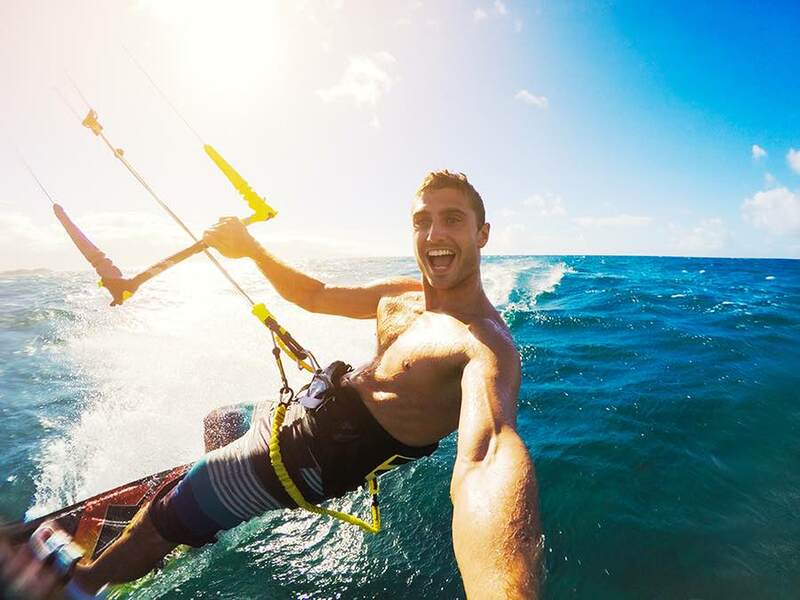 The East Cape is popular for kite surfing and the Pacific coast has several surf breaks where you will find less crowds. Find each surf break on our MAPS page. Level: Advanced. Direction: Right, Left. Location: Pacific side right before arriving to Todos Santos. Level: Beginners. Direction: Right, Left. Location: Pacific side at KM 65 of the Cabo San Lucas-Todos Santos road. Location: At KM 6.5 of the Corridor, closer to Cabo San Lucas. Level: All Levels. Direction: Right. Location: at KM 28.5. Access is below the Costa Azul bridge. Level: All Levels. Direction: Right, Left. Location: San José del Cabo’s main beach, close to the Holiday Inn. Location: East Cape, about 25 KM from San José del Cabo. Level: Advanced. Direction: Long Rights. Location: East Cape, about 30 KM from San José del Cabo. June through November: The summer months are known to be the best as the Southern Hemisphere’s swells send great waves to the Pacific, Cabo San Lucas, San José and the East Cape. December through February: East Cape and Costa Azul are on the flatter side. The Pacific can be good this time of year because it’s exposed to the west swell. March through May: This is the windy season. Swells are consistent and you’ll run into fewer crowds. There is something special about paddling out and finding yourself floating in the ocean with just a paddle and a board. 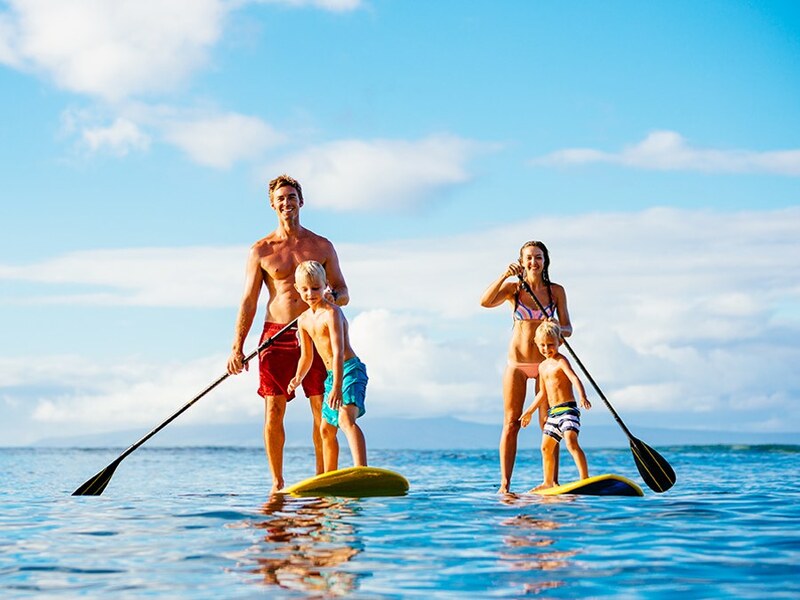 Stand up paddling is growing to be more popular each year and is available all around Los Cabos. It’s a great way to see marine life, to get a great workout and to enjoy nature. At Medano beach you can rent boards in several locations. Paddle along the rocks of Land’s End to make your way to Lover’s Beach and the Arch. Certain companies offer paddling lessons and some have yoga classes on the board. Your feet should be parallel, about hip-width distance apart, centred between the board rails (edges). Keep toes pointed forward, knees bent and your back straight. Balance with your hips and core. Keep your arms straight and twist from your torso as you paddle. Think of using your torso to paddle rather than your arms; you have more strength in the abdominal muscles than in your arms. Your gaze should be level at the horizon and avoid staring at your feet. If you’re paddling on the right, your right hand is lower and on the paddle shaft. Your top left hand is on the top of the grip. The elbow (angle) of the paddle faces away from you. Plant the paddle by pushing the blade all the way under the surface, pull it back to your ankle, then out of the water. To go in a reasonably straight line, paddle about 4 or 5 strokes on one side, then switch to the other. When you switch sides, you’ll reverse hand positions. When you fall aim yourself to the side so you don’t fall the board. Have you ever had a dream about flying like Superman or maybe swimming like a dolphin? 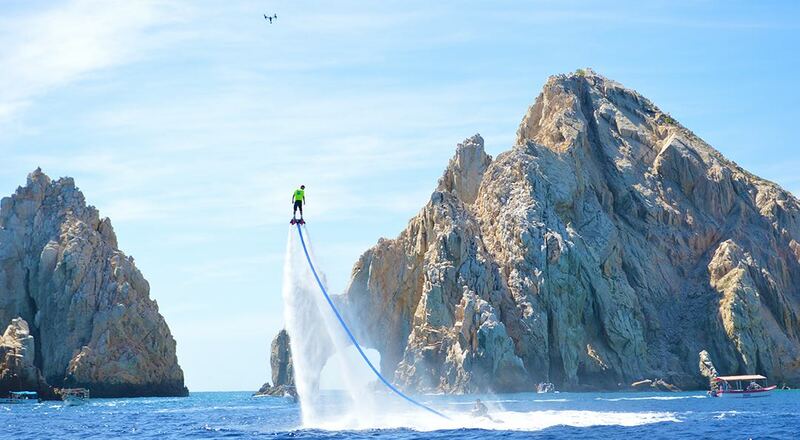 Dreams can come true in Cabo! 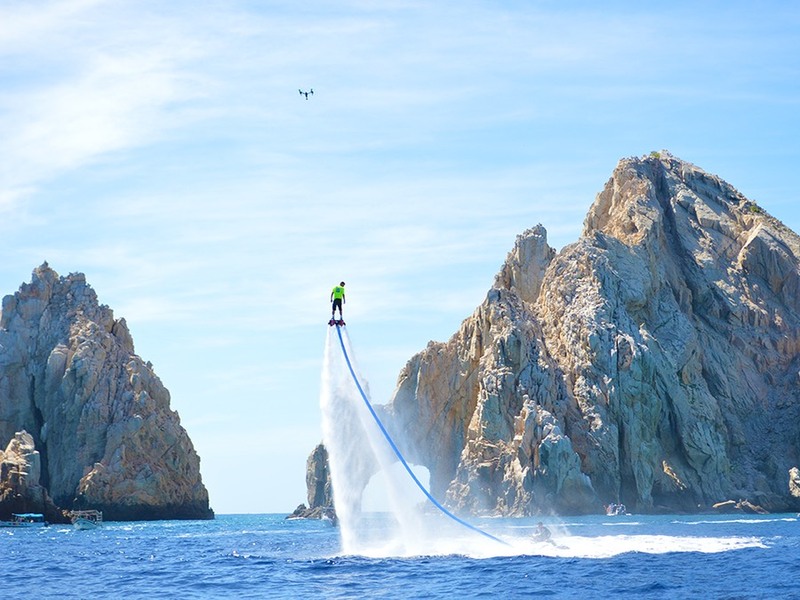 The FlyBoard is a device connected and powered by a personal watercraft, which allows propulsion underwater and in the air. Users are connected to the board by wakeboard boots, under which, water pressure provides thrust. A certified trainer controls the power and height and you control all the movement. This activity is available at Medano beach or in the Puerto Los Cabos Marina in San José del Cabo.